Ook Alpha-Audio is enthousiast over het TuneBox2 : Alpha-Rating: Erg goed! Zie de complete Review. 'We vinden de Nexum Tunebox2 een interessant product voor wie een streaming-oplossing zoekt zonder toeters en bellen. Het doosje zelf speelt gewoon prima. En het installeren is eigenlijk in een paar minuten gepiept'. Difference between TuneBox2 & Gramofon. NOTE - Allplay is very unpopular wireless audio application which is base on Qualcom technology. If user want to use Allplay to play music, you have to store you song into phone device. Both of TB2 or Gramofon has DAC inside. but TB2 has better performance. 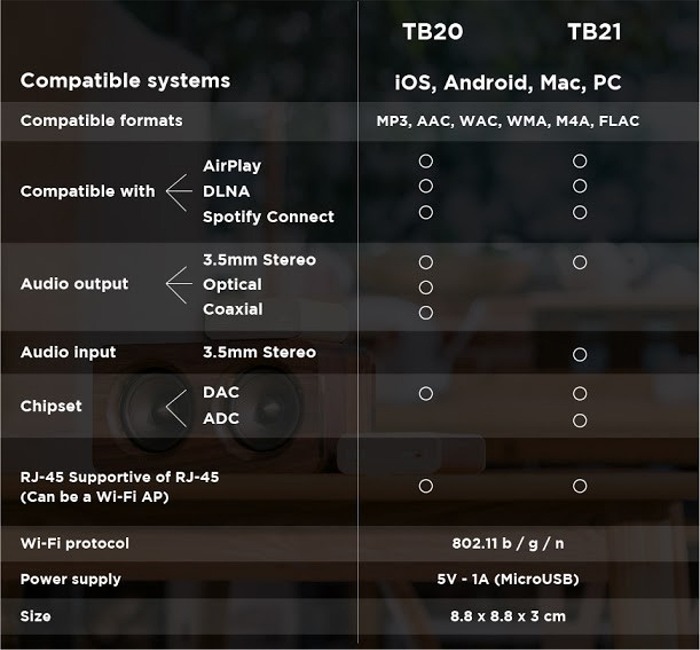 Also, TB2 has TB21 to support Analog Streaming with TB20. 1. What's the difference between TB20 and TB21? Do I need both? TB21 supports 3.5mm cable audio input, which can be from your CD, vinyl player, and so forth. And you can play the music from other speakers with other TuneBox2s. If you only play music with your phone, you're fine without a TB21. 2. Is audio inout the only difference bewteen TB20 and TB21? If you need a DAC, choose TB20, which supports digital output/coaxial audio output. TB21's desinged with a built-in ADC to accomodate analog input, but with no digital audio output. 3. How does the Party Mode work exactly? I push the Party Hotkey/button, and what's already playing with TuneBox2 will be broadcast to other TuneBox2s in the same network? 4. Does TB20 support 3.5mm analog input? 5. Does TB20's optical aux output support cable 3.5mm to RCA to amplifiers? 6. Do all TuneBox2s sync under Party Mode? Yes! It's 100% simultaneous under Party Mode. 7. Does the AP mode support 5GHz, or 2.4GHz only? 8. Does digital output support only 24bit 192khz? If I connect it to 24bit 96khz, there will be no sound, right? That's right! Definitely no sound to 24/96. We suggest you use TuneBox2's analog output. Please make sure your router channel is between 1~11. TB20 is currently follow US regulation (2.4G wifi grequency band). Meanwhile, we will also try to get support from IC company to see any improve to 12 ~14 channel. 10. Can I play music via TuneBox from a HDD on my PC or Laptop which is in the same WiFi network as TB2? The manufacturer will improve the manual and extend it in future production. 12. I am encountering WiFi unstability. Sometimes my TB2 is not found. A reset brings a temporary solution. How can I make it more stable? Please make sure TB2 is in the latest firmware. If not, please press "Version Updating" to get latest firmware.